NFM's May 2015 issue goes on-sale on April 27. Tom Dickson checks out the flashy Fendt Vario 939 to see if its advanced technology translates into ease of operation. Tom Dickson also checks out the Tow and Fert Multi 4000 fertilsier spreader which bagged an award at last year's Henty field days to see if it lives up to its hype. 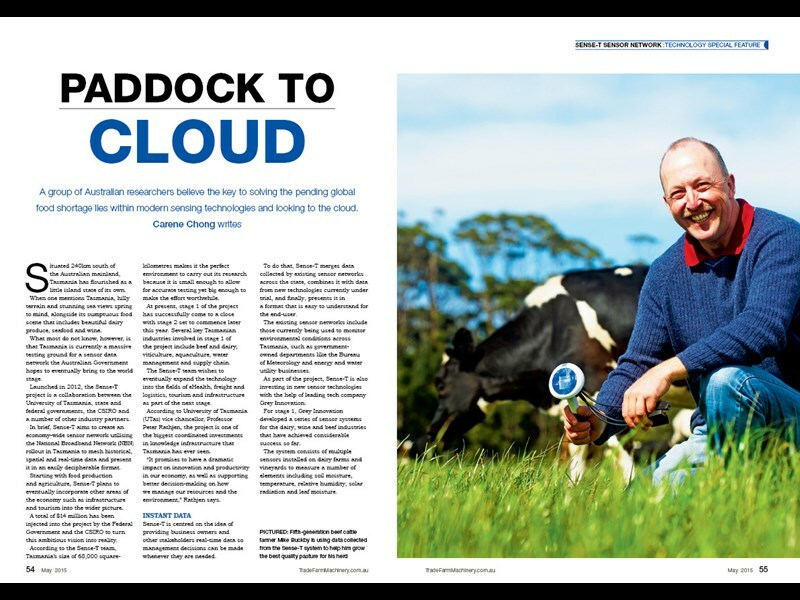 This issue's technology feature starts with the Sense-T story, an ambitious project started up by a group of Tasmanian scientists that could potentially change the face of agriculture. 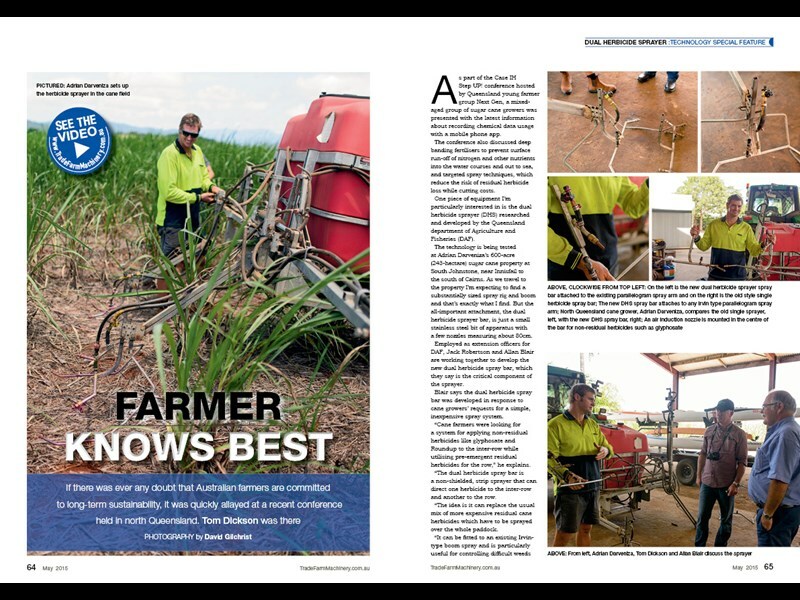 Tom Dickson has a closer look at a simple but ingenious dual sprayer designed to minimise run-off by leading minds in the Queensland Department of Agriculture, Fisheries and Forestry. 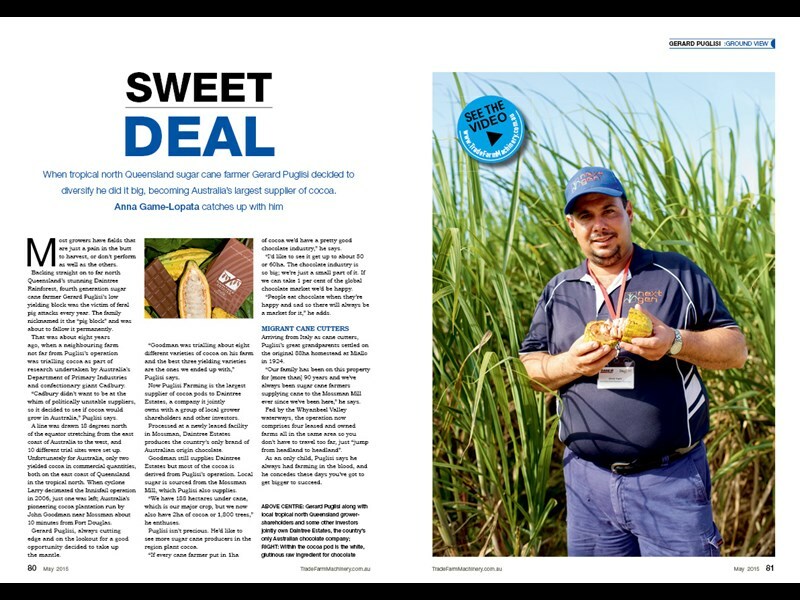 Anna Game-Lopata chats to sugar cane and cocoa farmer Gerard Puglisi. 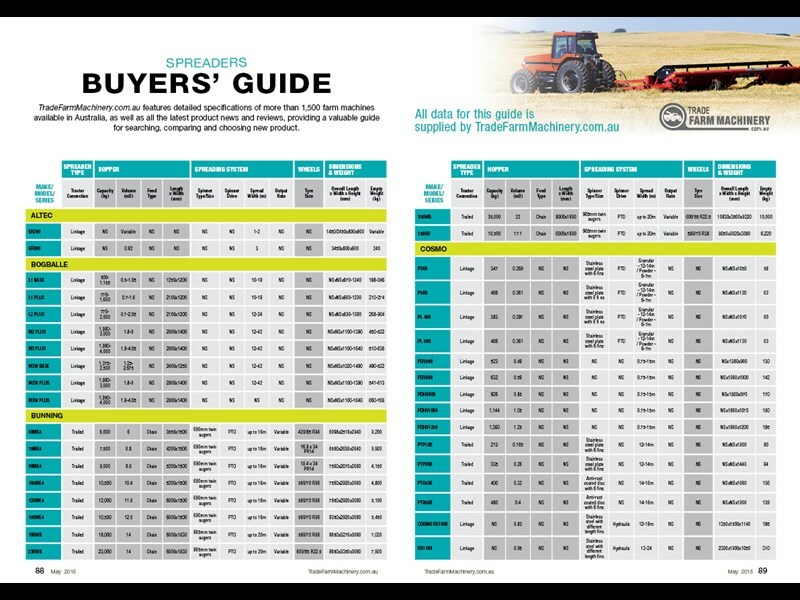 Don't miss our 8-page spreaders' buyers' guide. 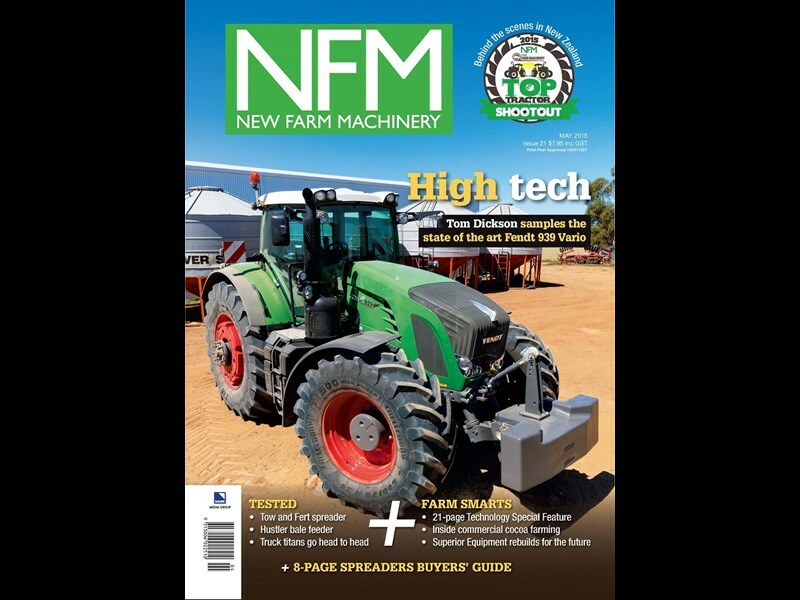 This month’s New Farm Machinery magazine, on-sale April 27 takes an in-depth look at the technology set to revolutionise the performance of agriculture. NFM’s inaugural technology feature starts on page 53 with Carene Chong’s investigation into the fascinating world of Sense-T, an economy-wide sensor network utilising the National Broadband Network in Tasmania. Working initially in agriculture, Sense-T meshes historical, spatial and real-time data and presents it in an easily decipherable format. Viticulturalist Matt Pooley, one of the farmers taking part in the Tasmanian trials, says the results speak for themselves. "With the Sense-T program, I am able to see what is unfolding over time in parts of the vineyard with real-time data," he says. 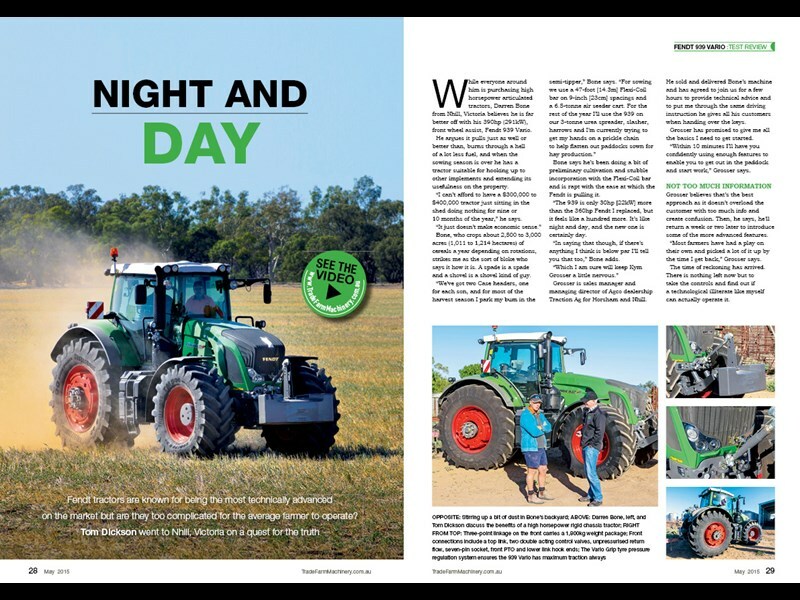 Other exciting technology highlighted in the feature includes Next Instrument’s CropScan 3000 grain analysing system and Farmscan Ag’s new 7000 Series controllers both of which were launched at this year’s Wimmera Machinery Field Days. Also, Tom Dickson takes a closer look at a simple but ingenious dual herbicide sprayer designed to minimise run-off by leading minds in the Queensland Department of Agriculture and Fisheries, and Responsible Economical Environmental Fertilizer Applicator (REEFA), a subsoil fertiliser applicator invented by cane industry engineer Michael Camilleri. Dickson also reports on the innovative Air-Pro Seed Metering System from Great Plains claimed to be the most accurate mechanism for delivering exact population of seed, correct placement and even spacing between each individual seed sown. Managing editor Anna Game-Lopata catches up with sugar cane farmer Gerard Puglisi, who pioneered precision agriculture in tropical north Queensland, founded the district’s support network for younger generation farmers and combined cocoa farming with tourism into a highly successful operation. Watch the exclusive video interview. Meanwhile, Brisbane reporter David Gilchrist reports on a remarkable comeback story from hay and harvesting implement manufacturer Superior Equipment. 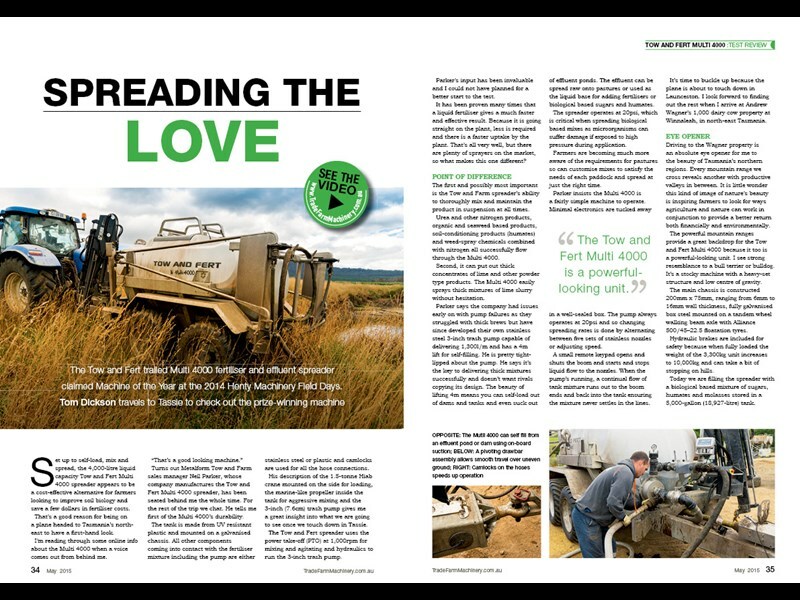 Last but not least, look up a comprehensive range of spreader specifications in this issue's spreaders' buyers guide.